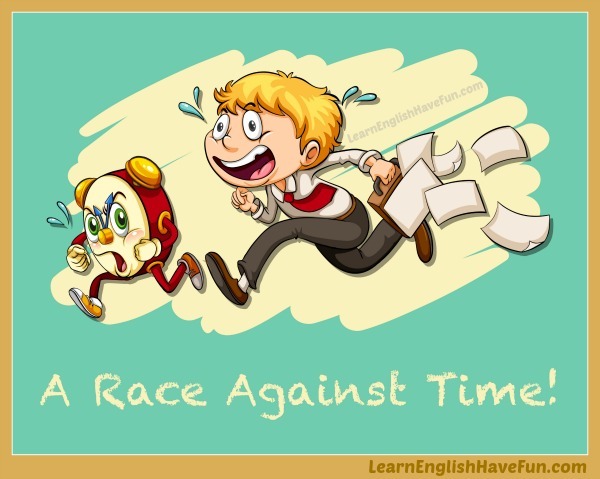 Can you understand the meaning of the idiom 'a race against time' by looking at the picture? A race against time (also a race against the clock / against time / against the clock): a situation where someone has to finish something quickly, in a short or limited amount of time. A race is when two or more things are competing against each other. It's pretty easy to understand and very easy to remember if you picture the image above in your head. Now for some example sentences to make sure it's very clear. Last night we were racing against the clock to put the packets together before the conference started today. It's a real race against the clock to prevent the spread of the Zika virus. I told the cabdriver I was racing against time to catch my plane and he drove 85 mph to the airport! The editors raced against time to write last–minute updates about the hurricane for the morning edition of the newspaper. This is the last morning we're going to race against the clock to get you to school on time. Tomorrow you're getting up at 7:30 AM! Everyone at the mall was in a race against time to finish their shopping before Christmas. As I raced against time to get my paper to my professor, I got into a car accident in the parking lot and had to turn it in late. If you just left 10 minutes earlier you wouldn't always be in a race against time to get to work. It was always a race against time in the mornings trying to get the kids ready for school. It was a race against time to find a new apartment before our lease was up. Why don't people immediately pull their cars over to the side of the road when they see an ambulance behind them racing against time? I hated working for my last boss because every project was a race against time. It was so stressful! If you found this idiom useful, sign-up for my free newsletter to learn about new idiom updates to my website and other news. It's practice time. I know it's hard to have the courage to write a sentence and post it but it will help you remember this idiom in the future. And, I'll give you feedback too! Are you the type of person that is always racing against time? When was the last time you raced against the clock?